Despite the fact that it probably gave more than a few frequent flyers heart failure, today’s American Airlines award surcharge scare is also a good reminder of both the value of transferable points and the fact that you shouldn’t hoard your miles because they’re almost sure to lose value over time in one way or another. After all, most award chart changes tend to be toward devaluation, not better value for flyers! Although this was a false alarm, it just goes to show that it can and does happen at any time, and could still happen in the future. One of the pillars of any successful frequent flyer mile strategy is to diversify your points portfolio. I’m not saying to be a promiscuous earner racking up a few miles here and a few points there across dozens of programs. Rather, you should think smartly about how and where you’re earning your points and miles, and focus your activity with the programs that give you the most flexibility when it comes time to redeem them. That’s why I always say that transferable points programs like Amex Membership Rewards, Chase Ultimate Rewards and Starwood Preferred Guest points are the best. These programs accrue your points into a central account, and then when you want to redeem them, you can transfer to any number of their airline or hotel partners. Because you have a choice, if one transfer partner program makes negative changes – like Delta’s future mileage requirement increases on international premium class awards – or if one airline is charging higher fuel surcharges on certain routes you would like to fly, you can transfer your points to another partner with more favorable redemption options. Here is a list of the travel partners of the three major transferable points program, the ratios at which their points transfer and the credit cards that will earn you each kind of points. Then read on below to find some other helpful posts about each of these points programs and how to maximize their value. American Express Membership Rewards has 16 airline transfer partners and four hotel programs. The Amex cards that accrue transferable Membership Rewards include cards like the Premier Rewards Gold card and Business Gold Rewards card as well as the business, personal and Mercedes-Benz versions of the Platinum Card. 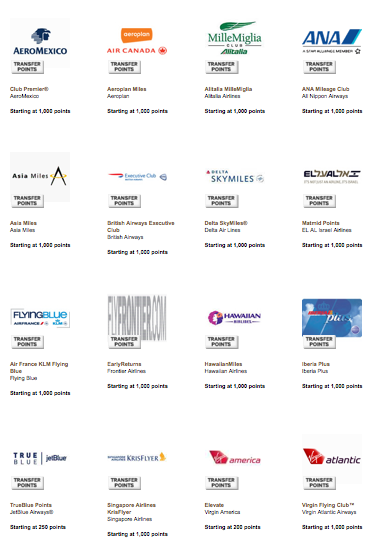 Membership Rewards has 16 airline partners. 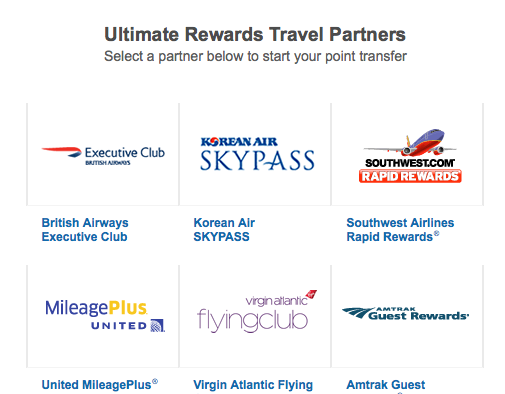 Chase Ultimate Rewards has ten transfer partners including five airlines, four hotels and Amtrak. The three cards that accrue transferable Ultimate Rewards points (as opposed to those that can be redeemed for cash back or directly for travel through pay with points) are the Sapphire Preferred, the Ink Bold and the Ink Plus. In addition to being a hotel points program, Starwood Preferred Guest also has 31 airline partners, most of which points transfer to at a 1:1 ratio – and when you transfer an increment of 20,000 points, you get a 5,000-point bonus. Now through September 3, 2013, both the personal and business versions of the Starwood Preferred Guest card from American Express are offering limited-time 30,000-point sign-up bonus offers when you spend $5,000 in 6 months.